The Posiflex KS-6715 now takes over where the KS6215 left off. Everything you loved about its predecessor, you will love even more in the KS-6715 with its increased performance, ports, memory, and complete peripheral compatibility. It is a price-performer, giving you more for your hardware investment. Featuring our patented aluminum chassis for maximum heat diffusion, a 1.6GHz CPU, it offers 110% more performance over its predecessor with its increased functionality. Providing even greater energy efficiency, look to the KS-6715 for additional costs savings. Available in a desktop configuration, which easily converts to a wall mount solution, it offers you adaptability and scalability to propel your business to greater heights. 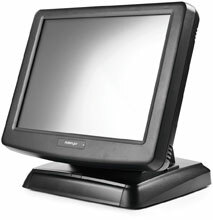 The Posiflex KS6715H11B1C is also known as Posiflex Business Machines	POS-KS6715H11B1C	.